Call of Duty's European general manager says that Activision's goal with Call of Duty: Black Ops is to break the record it set by its predecessor. Call of Duty: Modern Warfare 2 exploded into the record books last year, selling nearly five million copies on its first day and becoming the biggest media release in history. Equaling something so momentous would be an incredible feat, but MichaÃ«l Sportouch, Activision's European general manager, thinks that Black Ops might just be able to do it. 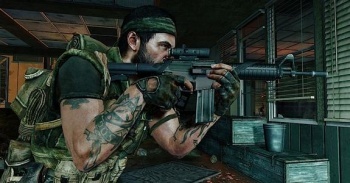 Sportouch said that the resources that Activision had invested in both the making and marketing of Black Ops was the highest of any title the publisher had ever made, which had resulted in a fantastic game and a fantastic campaign. He added that Black Ops would be available on more platforms than Modern Warfare 2, and would be able to take advantage of a higher install base on the Xbox 360 and PS3. But despite the investment and the favorable conditions, Sportouch hadn't allowed himself to become over-confident, and said that it wouldn't be easy to beat Modern Warfare 2's record. He added that there were a lot of high-profile games - games such as Medal of Honor, Gran Turismo 5 and Assassin's Creed: Brotherhood - that would be competing with Black Ops for consumers' money. It's certainly not impossible that Black Ops could outsell MW2, but many analysts don't think it actually will, and have predicted sales of between ten and twelve million copies. While those are excellent figures, they're just over half of what Modern Warfare 2 has sold to date. Whatever happens, we're going to have to wait until the game is released on November 9th to know for sure.